If you were invited to sit a Saville Diagrammatic test, you're probably asking yourself what is this test, and how can to prepare for it. Get answers to these questions here. 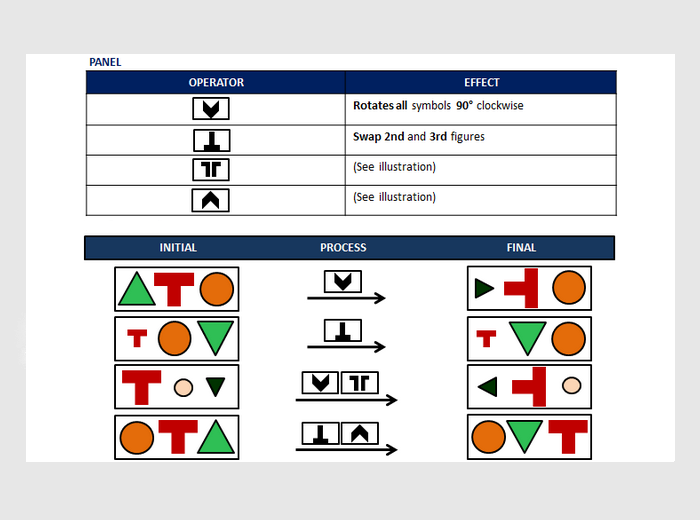 A panel with shape operators and their effects. An input-output operator illustration that explains the effect through an example. While Saville Consulting provides candidates with preparation guides on their website, there are not enough questions, nor are there realistic time constraints that can actually simulate the test environment. JobTestPrep offers you a complete practice pack that includes tailored practice unites that follow the same characteristics of Saville's diagrammatic reasoning tests (input-output diagrams).